Natural North Florida’s Suwannee River Wilderness Trail offers a unique opportunity to see and paddle one of America’s great rivers. The Suwannee River starts its journey in Georgia’s Okefenokee Swamp and meanders through north central Florida until it reaches the Gulf of Mexico at the town of Suwannee. 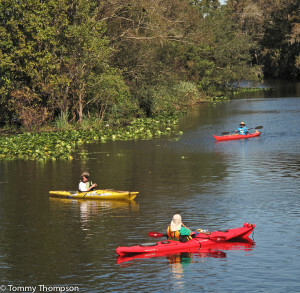 One important yearly kayak event is the PaddleFlorida trip down the river, following the Suwannee River Wilderness Trail. The trail is managed by Florida’s State Parks system. There are several options as well as limits to the number of paddlers allowed to participate. What follows is a brief description, with full information and itinerary at PaddleFlorida’s website. Meals will be provided by professional caterers or local civic groups. Expect hearty, hot fare for breakfast and dinner. On-water lunch stops will include ample portions of fruit, chips, cookies, PB&J sandwiches, water, and other fluid replacements. The meal plan is optional. You may choose to bring and prepare your own meals if you prefer. If you have dietary restrictions, please contact Bill Richards at bill@paddleflorida.org for details. Fees do not include shuttle transportation. If you are not paddling the whole trip, you may need to arrange for your own shuttle transportation. Contact Bill Richards at bill@paddleflorida.org for more information. Paddlers can choose a pre- or post-trip shuttle for themselves and their boats. Those choosing a pre-trip shuttle will need to report to the Shrine Club in Branford by 1PM on October 22. Paddlers and their boats will then be shuttled back to Madison Blue Springs State Park to check in for the trip. Pre-trip shuttlers can save $25 by dropping off their boats at Madison Blue Springs State Park before driving to Branford to meet the shuttle. Paddlers may also choose to leave their vehicles at Madison Blue Springs State Park and take the post-trip shuttle back there at the trip’s conclusion. 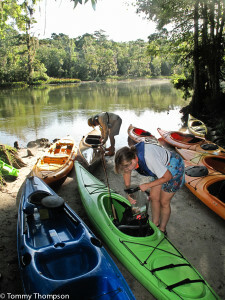 Paddlers needing to rent a canoe or kayak and related gear may contact our partnering outfitter, Suwannee Canoe Outpost.